Saperavi (Georgian: საფერავი; literally "paint, dye, give color") is an acidic, teinturier-type grape variety native to Georgia (country), where it is used to make many of the region's most well-known wines. It is also grown in small quantities in the Niagara and Finger Lakes regions of New York State as well as former USSR countries. Its leaves are 3-lobed, large, and roundish. The berries are medium to large, elliptic or round depending on the type, dark bluish, and thin-skinned; with a maturation period of approximately 5 months and moderate productivity. It is an extractive wine with a characteristic bouquet, a harmonious taste, and pleasant astringency. Its alcoholic strength ranges from 10.5-12.5% and titrated acidity 5-7%. It is known to have been in production since 1886. 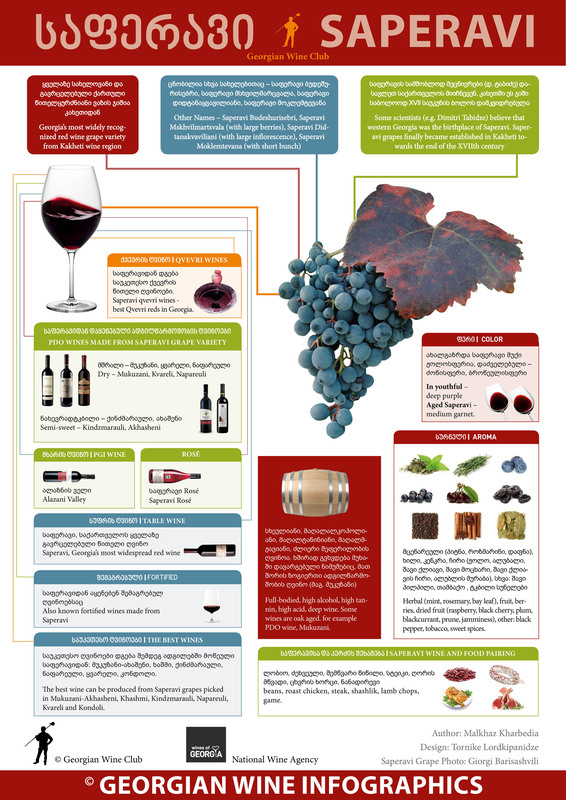 Saperavi grapes produce very deep red wines that are suitable for extended aging. It has the potential to produce high alcohol levels, and is often blended with lighter varieties. It is by far the most dominant Georgian red grape in terms of overall production. Saperavi is a hardy variety, known for its ability to handle extremely cold weather and is popular for growing in high altitude and inland regions such as Kakheti. It is a teinturier grape, containing the red anthrocyanin within the grape pulp as well as the skin and is unusual in being one of very few such grapes used in single-varietal winemaking. The Saperavi grape originated in the Kakheti region of Eastern Georgia and now is spread throughout its entire territory (Kakheti, Saingilo, Kartli, Shavshet-Klardjeti, Imereti, Guria, Racha and Lechkhumi). Georgia is known as one of the oldest winemaking regions of the world, with archeological research showing evidence of cultivation dating to 5000 BCE. The Saperavi variety is one of the oldest cultivars from the region, and has consistently been the most important in Georgia's commercial winemaking industry. Saperavi grapes are used predominantly in Georgia, but have spread to other regions of Eastern Europe more recently (Purcari, Moldova). Saperavi cultivars are also being grown in New World wine regions, notably in Finger Lakes, New York area vineyards. It has shown promising results for a few growers in Australia, where it was pioneered in the King Valley Region of North East Victoria. Kindzmarauli; a semi-sweet wine, aged for 2 years, produced in the Kvareli region. Grapes are harvested later than for most other wines made from Saperavi. Akhasheni; a semi-sweet wine similar to Kindzmarauli, produced in the Gurdzhaani region. Mukuzani; a dry wine, aged for 3 years, produced in the Mukuzani region. It is sourced from the best of the local vintages; and is considered as one of the best of the Georgian wines. Napareuli; a dry wine, aged for 3 years, produced in the Napareuli microzone, Telavi region. It is sourced from the best of the local vintages; and is considered as one of the best of the Georgian wines. Alazani; a light semi-sweet wine, produced in the Alazani region. A blend of 60% Saperavi and 40% Rkatsiteli. The warmer climate produces sweeter grapes than other regions. Saperavi is also known under the synonyms Didi Saperavi, Kleinberiger, Nerki Khagog, Patara Saperavi, Saparavi, Sapeavi De Kakhetie, Saperaibi, Saperavi de Kachet, Saperavi de Kakhetie, Saperavi Patara, Sapeur, Sapperavi, Sapperavy, Scoperawi, and Szaperavi. ^ Jancis Robinson, ed. (2006). "Teinturier". Oxford Companion to Wine (Third ed.). Oxford: Oxford University Press. pp. 688–689. ISBN 978-0-19-860990-2. ^ "Saperavi at Finger Lakes". This page was last edited on 26 December 2018, at 21:25 (UTC).